It wasn’t all gloom and doom where I worked. There were times and days when things were good and not so bad. Here is a list of positively great things associated with where I was employed. 1. I paid one of my student debts totaling $3700 off in full in the six months I worked there. 2. I am in awesome physical shape from the physical labour. Only another $18,500 to go! 3. I worked with some great people; people who made me laugh; people who worked as hard as I did. 4. They gave me a part-time job when I needed one. 5. I was surrounded by art supplies! 6. Everyday I was inspired by art, prints, photos and oddities customer’s brought in to have framed. 7. I got to cut glass. 8. I learned to be efficient in the time frame I was given for varying tasks. 9. I got to use air powered tools! 10. I met and spoke with many local artists weekly. 11. They were understanding when things got rough for me while nearing the end of tapering off Paxil last November. 12. They gave me time off (unpaid) when my grandmother passed away. 13. They are marking me off as a good employee because I gave written notice. 14. If I ever want to work for them again I am always welcome to come back. 15. Finally, having this job gave me the confidence to know that I can work and do a good job at it. For the next three weeks I’ll be working with my Dad and brother renovating a building they own. I’ve worked with them before and enjoy doing so. I’m a good worker and when able to have always given a hand. Women are just good at paying attention to the small details that men may miss. Now don’t go attacking me for saying that but I know my Dad and brother and you don’t. They do fabulous restoration work. I’m so excited. This building is near 100 years old. So, if you know of any part-time work email me or leave a comment on this post. I am open to all types of work. The summer is coming and I’ll be planting and maintaining a huge vegetable garden again. That in itself is backbreaking work. A part-time office or contract work at home gig would be grand. And to clarify why I choose part-time over full-time work. I need time to write, draw and paint. Without doing those three things I do and have become very sick. I stay healthy this way which is better for me and also great for the people who employ me. 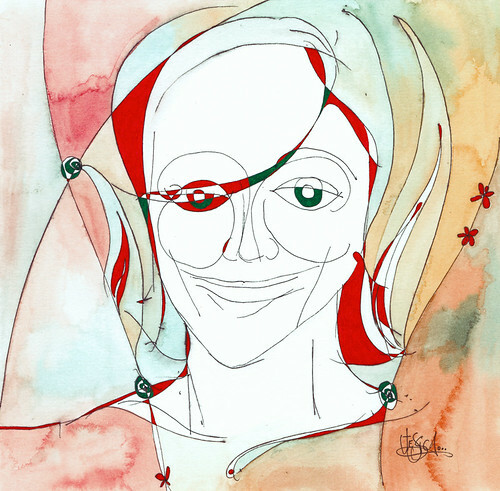 The smiling woman semi self portrait will be available in my art shop later today. She is looking a little magenta though. I must rescan her. 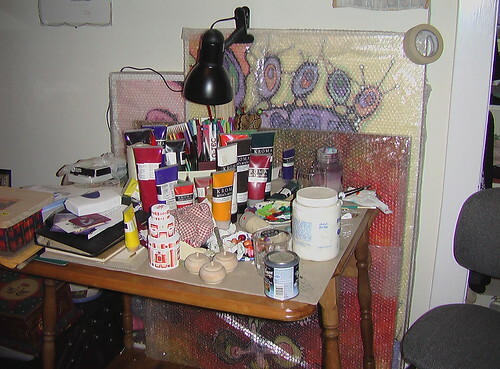 At the time of taking this photo I was and still am in miniature painting mode; painting itsy bitsy wooden beads and containers some measuring no larger than 1.5cm by 3cm or 3/4″ by 1 1/4″.